Amphiboles often elongage producing schistose texture, although they may be randomly oriented also. Lineated schistose foliation produced by the lining up of elongate amphibole (var. hornblend) crystals; seen trending left and right in this image. Other minerals such as quartz and feldspar are completely intermixed among the amphibole. The dark, shiny appearance of this rock is typical, although it may range to lighter colors too. It might be possible to confuse this with an mafic igneous rock, since many of the minerals are the same, but the presence of foliation will identify it as igneous. 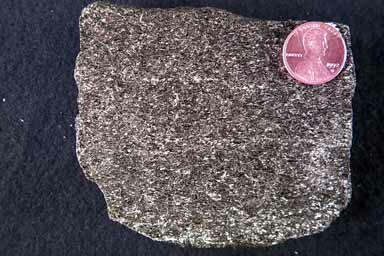 Amphibolites are part of a metamorphic sequence that begins with magic igneous rocks and progresses through greenschist, to amphibolite, to granulite.